In this step, you will learn how to build multiple model objects. All objects which have not yet been built will be queued in the order in which they need to be built, based on interdependencies with other entities. 1. Click the Build Model button on the main toolbar. A window will be displayed asking what type of build you wish to perform. Select Entities requiring build and click the OK button. Again, a message box will be displayed informing you that build activities have been queued and asking whether you wish to view the Builder Queue at this point. 2. Click the Yes button. 3. Click the Build toolbar button to start the build. This dialog allows you to specify whether you want the modeler to generate referential integrity rules between related files when the Build Relationships activity is performed. 5. Leave the check box checked and press the OK button. A progress bar will be shown while the build is being performed. Note that the status of the build activity changes to Active and then to Built or Failed. The build will take approximately 1 minute. Note that some of the build activities related to the Customer, Order and Ordered Product entities have failed. 6. 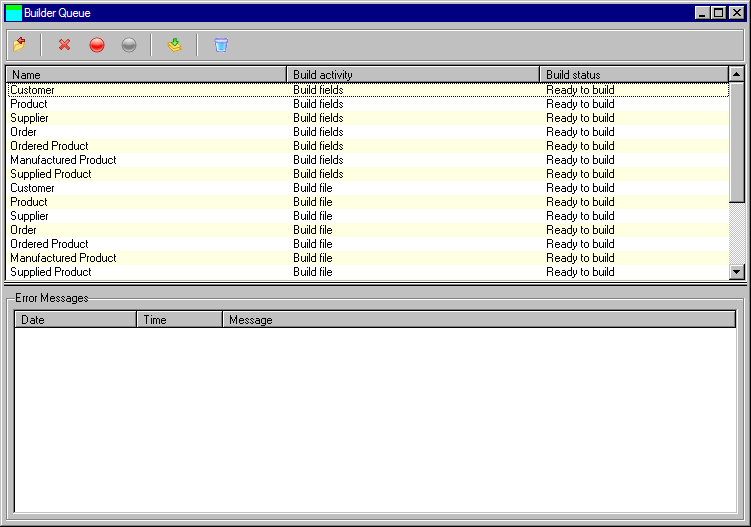 Select the Build Database File activity for the Customer entity. An error message explaining why this build activity failed is displayed in the Error Messages list at the bottom of the window. 7. Now select the Build Relationships activity for the Customer entity. An error message says that this activity has failed because the Database File has not been built for the Customer entity. Similarly, the Build Relationships activity for the Order entity has failed for the same reason. The Customer entity has not been database built, and so a referential integrity rule cannot be created between Order and Customer. 8. Close the Builder Queue.